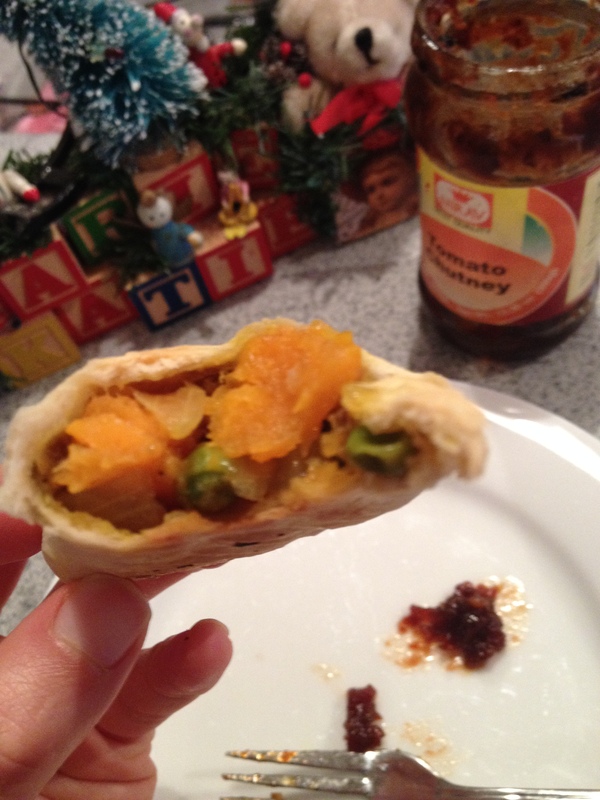 So I ate a REALLY GOOD lamb samosa from a package yesterday and was so curious about how I could re-create the hearty spice of a lamb samosa mixed with the richness of a sweet potato. I’ve seen a few sweet potato + lamb recipes before, but really, I adapted a strictly lamb-based samosa to create these as my parsnip samosas came out a little too sweet for my liking last time. Keep your eyes peeled for the first video post in the works! This is my first try so stay patient with me here. Ok I love these samosas because they are very forgiving. I started with happyyolk’s referenced Saveur recipe for the dough after trying a healthier one last time. For a baked samosa, you’re not going to get much better than this. The dough is not super flakey like a galette kind of dough, but it has just enough butter to give it enough flake to have a crunch to it. If you’re not frying these babies, then that’s the closest you’re gonna get. There’s a methodology to this madness guys. Don’t put yourself in a cook vs. baker category. We can do both here. Get the dough right and you’ll be much more confident experimenting with the filling. Besides, I told you already, there’s butter in this dough, so if you are lacking a little flavor in the filling, you still got the butter going for ya. Are you one of those people that wants a filling-ish appetizer? I am. 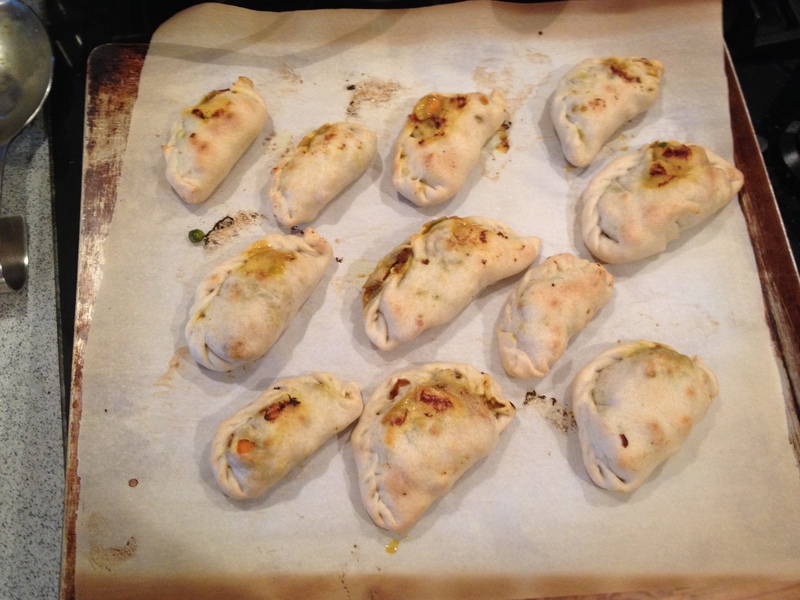 I need one of these meat and potato pockets to keep myself going until dinner-time. Whatever time you eat these, they are a good afternoon snack or appetizer. Here’s how we start. First, prep your dough. Follow Saveur’s recipe to make the dough. They suggest using around 6 tablespoons of water, but mine came out to about 8. And if you have a food processor, by all means use it here. Wrap up your dough and let it refrigerate while we make the filling. Start by toasting your whole mustard and cumin seeds to bloom the spices. If you don’t have these, don’t worry about it. Honestly I was just experimenting with using whole seeds :). Once fragrant, empty into a small bowl and set aside. Heat olive oil on medium heat, add your chopped onion and let soften until translucent, about 5 minutes. Then add garlic for one more minute. Add in the curry powder, cumin, salt, coriander, tumeric, and coat the onion and garlic with them. Add the lamb and break it up into small crumbles. 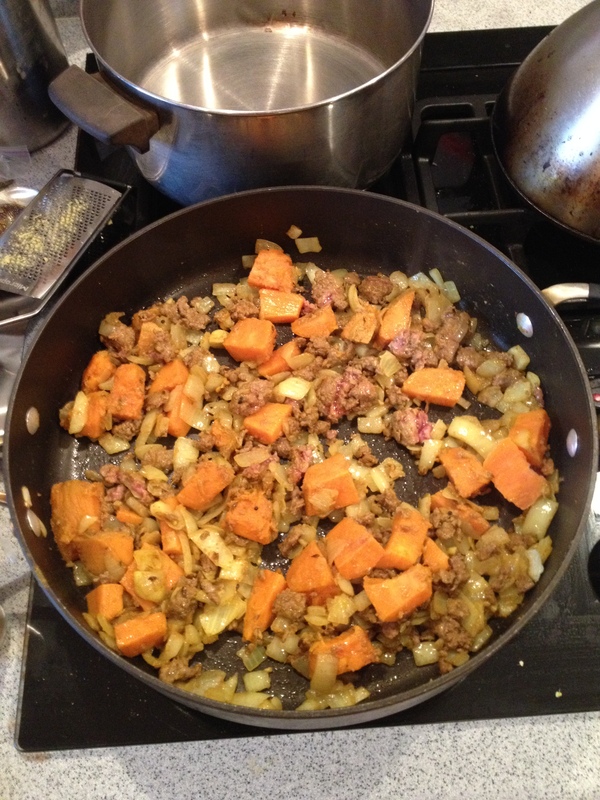 Peel your soft sweet potato and cut into small chunks while the lamb starts to brown. Once it browns, add in your sweet potato. Now add in your hot pepper flakes and the whole toasted seeds. At this point, the oil will be mostly taken by the lamb, so add in your chicken stock and add the frozen peas. 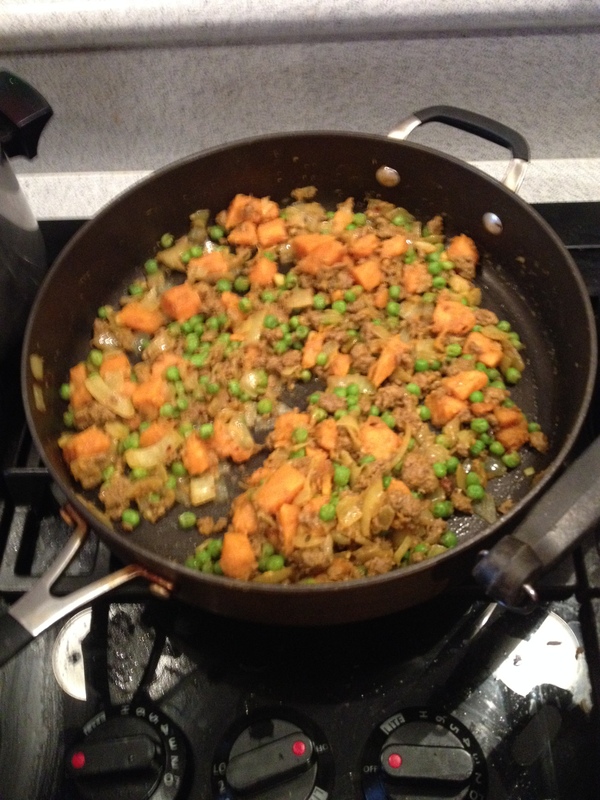 Let it simmer on medium heat, slowly breaking up the sweet potato as it softens. Continue to add chicken stock if it looks dry. 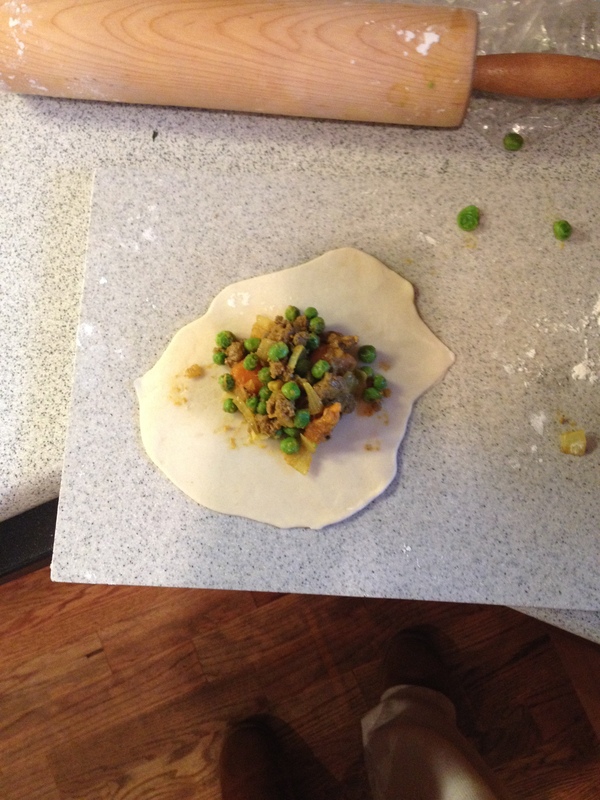 Once the peas have lost their frost, turn the heat down to very low, put a cover on the skillet, and let the filling absorb the stock and spices. The point here is to make sure you’ve got a thick enough filling. There’s no worry on this step, timing and look of the filling is entirely up to you and your eyes only. Just think about what texture you want when you bite into a spicy pillow with a little crunch on the outside. Now we’re in a happy place! One it looks about ready, turn off the heat, cover, and lets get those pillows ready. Take the dough out of the fridge and prep your oven to 450 degrees F. Break off your dough into ten even pieces and roll them into little balls. I cut the dough in half and made each half into 5 pieces. Cover the balls you are not using with a towel. Starting with the first ball, roll it into a flat circle. 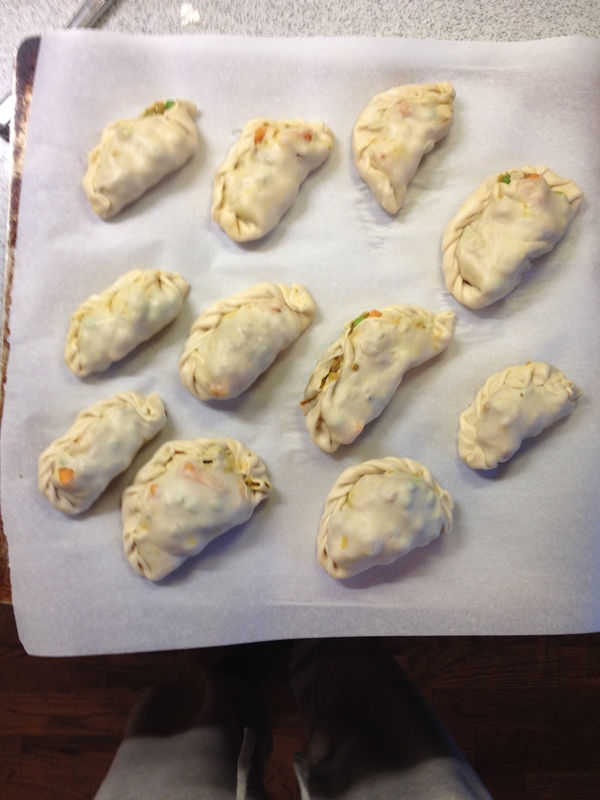 Add a spoonful of filling on one half, making sure there is room at the edge for crimping. Swiftly fold over the other side into a half moon and press the top and bottom layer together lightly to close. Some of your filling might puff out, that’s okay! It’s rustic remember. Starting at one end, fold the edge together toward the filling, snuggling in the pocket. Continue to fold the edges over one another, crimping the open edge inward so it again, “snuggles” the filling in tightly! It’s okay if it doesn’t work out the first time, you’ll get the hang of it. The key is to just keep going in the same direction so there are no air pockets in the seam. 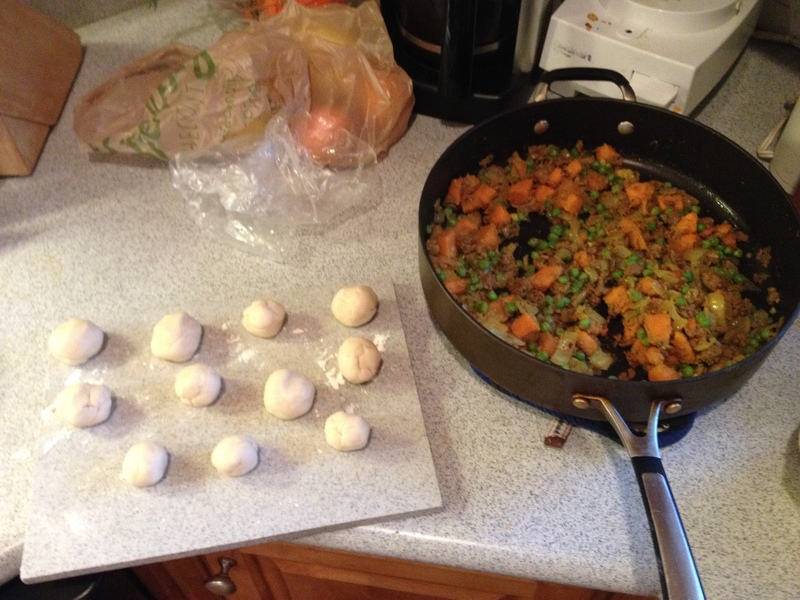 Place the samosa on a greased cookie sheet and continue with the others, until you have 10 samosas. Bake for 15 minutes at 450 on the middle rack, then turn the samosas over and cook for another 3-5 minutes until both sides are speckly golden brown. Let cool for about 5-10 minutes. Enjoy with some chutney, Indian pickle, or by itself!